Washington - Nearly two-thirds of Americans have experienced some kind of data theft or fraud, leaving many mistrustful of institutions charged with safeguarding their information, a poll showed Wednesday. Smaller percentages said their email or social media accounts had been compromised or that someone had impersonated them in order to file fraudulent tax returns. Those surveyed were concerned about telecom firms, credit card companies and others, but especially wary of the government and social media companies. Only 12 percent said they had a high level of confidence in the government's ability to protect their data and nine percent said the same of social media sites. 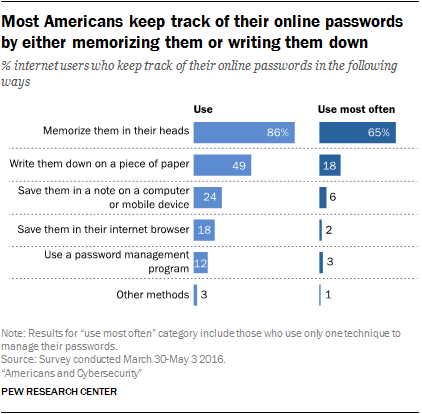 Yet the survey also found most Americans fail to take a proactive role in their own security with steps such as password management and enhanced authentication. While half of those surveyed said they have used two-factor authentication on their online accounts -- requiring a code sent to a phone or separate account -- many use similar passwords in multiple sites or share passwords with others, Pew found. The vast majority -- 86 percent -- said they keep track of passwords by memory, and only 12 percent used password management software which is believed to be the most secure. More than one in four respondents said they did not lock their smartphone screen, and some neglect to install important updates for their phones or applications. The report is based on a survey conducted from March 30 to May 3, 2016, among 1,040 adults, with a margin of error for the full group estimated at 3.4 percentage points.